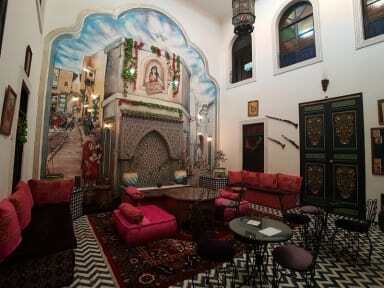 My stay at Funky Fez was great - the staff were very warm, welcoming and helpful. I'd say the location is of this hostel is really good, it's easy to find and very close by to the medina without actually being entangled in the streets of the medina. My flight incoming to Fez was delayed and the staff were great in organising my taxi to accommodate this too :) I would definitely recommend staying here. The atmosphere at this hostel is definitely worthwhile. Laundry service on-site, terrace with views of the Médina. Free continental breakfast but dinner is 50 dirhams. Staff is a hodgepodge mix of amiable volunteers. WiFi connectivity could be better...(needs more/better network routers). Basic hostel. Hot showers and comfy beds. One particular staff member, an overloud Mexican fellow ,”Chato”, was abusive and seemed to be lacking even the most basic hospitality skills. He took a dislike to me and soured my stay there. I was told to “go away”. He dropped my laptop without any apologies. I was threatened with physical violence. And asked to “step outside” several times. If this is the level of customer service provided at this establishment then i am afraid i cannot recommend Funky Fes in any shape or form. The bedsheets had brown stains and hair. Mold was everywhere on the walls especially in the bathrooms. The mold is not only on walls but also on paper signs that could be removed easily. Loud music was playing till about midnight and from about 8 am. The hostel is located very far away from the medina. We had to wake up in the middle of the night because they gave us the wrong bed of other people. The only positive side of the hostel is the rooftop terrace from where you have a nice view.